You’ve seen it everywhere by now. The “Go Green” movement is hyped up on invoices and bills and all sorts of random material. They typically include a cute little leaf and some quirky phrase about saving trees. The idea is that by using less paper, by signing up for online statements, the consumer is doing the environment a favor. Are you part of the 84% that believe paperless promotions are in it for the cost reduction? The great majority of us see the “go green” chant as simply a money-saving ploy. They’re not actually interested in environmental change. Most just want to save on printing costs. This misleading viewpoint suggests that by not using paper, you’re saving the trees. You’re helping prevent deforestation. You’re saving the world! This just doesn’t add up when we consider the source. Paper, it turns out, comes from a renewable and reliable resource, plus it’s highly recyclable. Paper fibers can be recycled many times before they’re too short to use. At that point, fresh fibers are mixed in to start the process all over again. There is 49% more wood volume than 50 years ago. Forest loss is caused by urbanization and development, not forestry. In fact, US pulp, paper and other wood products provide an incentive for forest owners to retain well-managed forests instead of converting the land to non-forest use. If our forestland loses its economic value, it will gradually disappear in favor of other land uses. So there you have it. Go paperless and you just may encourage deforestation. But Wait, Isn’t Digital Greener? We’ve written before about how the digital world impacts the environment. Resources are not only consumed with the initial creation and end disposal of our devices… Every power up, every charge, even every email sent leaves a footprint. The idea that files are cleaner in The Cloud should dissipate when you consider the energy consumption of one single server room. That room, by the way, is likely climate-controlled so the precious hardware inside never overheats. That hardware, by the way, is plugged in and running 24/7. 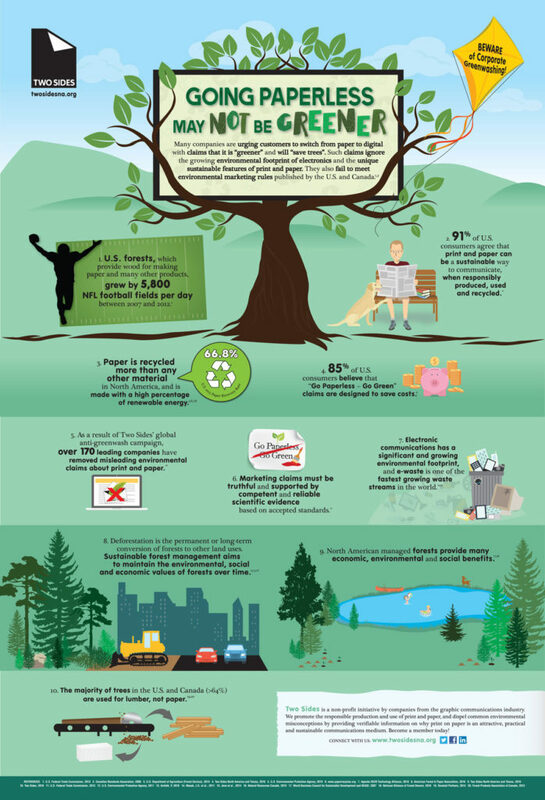 Digital has many environmental impacts that are sometimes overlooked and often completely ignored. So the next time you see or hear GO GREEN, think twice. If managed and recycled responsibly, print material is far more sustainable, renewable, and eco-friendly than the alternative. For more about the above facts, check out http://www.twosides.us/mythsandfacts.